Robert Aitken (1734–1802) was a Philadelphia printer and the first to publish an English language Bible in the newly formed United States. He was born in Dalkeith, Scotland. Starting in Philadelphia as a bookseller in 1769 and 1771, Aitken started publication of The Pennsylvania Magazine in 1775, continuing through 1776. He also printed copies of the New Testament in 1777, 1778, 1779, and 1781. He died in Philadelphia in 1802. The Aitken Bible of 1782 was reviewed, approved and authorized by the Congress of the Confederation. The Bible was reviewed first for accuracy by the Congressional Chaplains White and Duffield and they reported on its accuracy. Then the Journals of Congress for September 1782 records on page 469, "Resolved. That the United States in Congress assembled highly approve the pious and laudable undertaking of Mr. Aitkin, as subservient to the interest of religion as well as an influence of the progress of arts in this country and being satisfied from the above report (by the congressional chaplains), they recommend this edition of the bible to the inhabitants of the United States and hereby authorize him to publish this recommendation." (Spelling has been modernized). 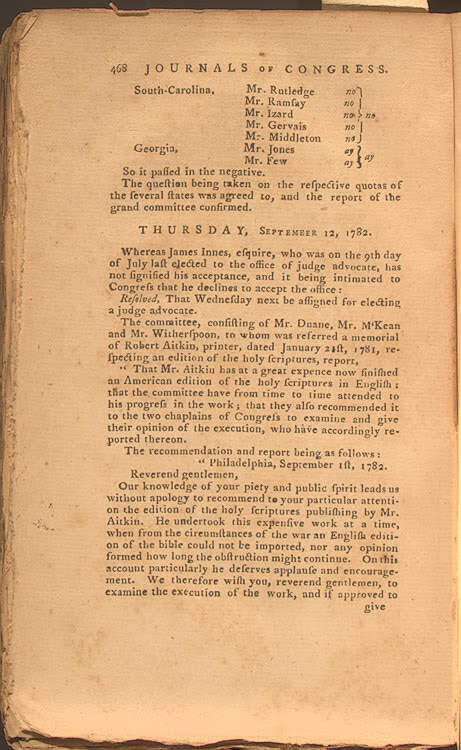 On Thursday, September 12, 1782, Congress reviewed a report dated September 1, 1782, from their Congressional committee, and signed by the committee Chairman, James Duane. The committee had been, "…referred a memorial of Robert Aitkin, dated January 21st, 1781, respecting an edition of the holy scriptures." This committee had, from time to time, checked on the progress of Aitken's work, and their report stated, "Our knowledge of your piety and public spirit leads us without apology to recommend to your particular attention the edition of the holy scriptures publishing by Mr. Aitkin." 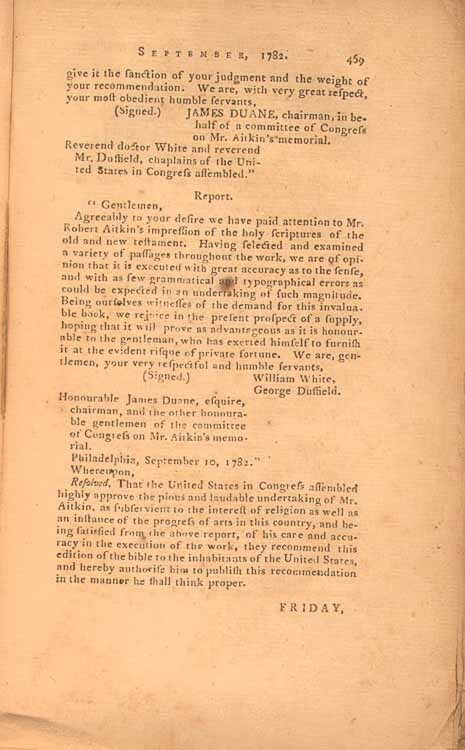 Library of Congress  Next Congress reviewed a report dated September 10, 1782, from the committee, and signed by the Chaplains of the United States in Congress assembled, William White and George Duffield. This report stated they had reviewed the printing and it was found to be, "…with as few grammatical and typographical errors as could be expected in an undertaking of such magnitude." Library of Congress  The outcome is listed as, "Resolved. That the United States in Congress assembled highly approve the pious and laudable undertaking of Mr. Aitkin, as subservient to the interest of religion as well as an influence of the progress of arts in this country and being satisfied from the above report (by the congressional chaplains), they recommend this edition of the bible to the inhabitants of the United States and hereby authorize him to publish this recommendation." The Holy Bible as Printed by Robert Aitken and Approved & Recommended by the Congress of the United States of America in 1782. New York: Arno Press, 1968. Unknown, . United States. National Archives. From George Washington to John Rodgers, 11 June 1783. The Rector and Visitors of the University of Virginia, Web. <https://founders.archives.gov/documents/Washington/99-01-02-11434>. This page was last edited on 19 July 2018, at 06:18 (UTC).